President-elect Trump’s administration has been discussing a large bill that would transform our country’s infrastructure. While everyone agrees this is good, there is some disagreement on what “infrastructure” actually means. 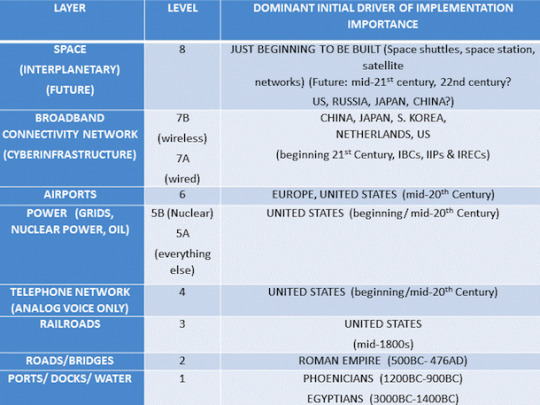 A white paper by James Carlini from 2009 describes infrastructure as “The Platform for Commerce.” His definition of the Platform for Commerce includes all layers of infrastructure as they evolved over the last 5,000 years, including broadband connectivity and the Internet. Trump and his appointed task force should be discussing the entire Platform for Commerce before embarking on a strategic direction and committing funding for investment in infrastructure. U.S. Senator Shelley Moore Capito (R-W.Va.) recently wrote a letter to Donald Trump’s administration urging them to include broadband deployment measures as a core component of any infrastructure proposals. In Capito’s home state of West Virginia, as many as 74% of rural residents lack proper access to broadband services that meet FCC benchmarks. The senator touched on an important note about being on the wrong side of the digital divide. West Virginia simply can’t attract and keep new business ventures if its residents are not connected through access to broadband. This does not just apply to West Virginia, but every rural community in the country. Broadband spurs job creation and economic development in every community that has it. In addition to broadband, infrastructure that integrates both physical and digital components will be critical to delivering the next wave of social and economic change. Yes, cars still drive on roads and planes fly in the air, but we are in an era where IT is being embedded into physical devices and structures—what is now being called hybrid digital infrastructure. Some examples of this digital infrastructure: Traffic lights with the ability to sense vehicles in real time and change signals, and water mains embedded with sensors to detect and transmit information on leaks. Smart infrastructure enables the easy collection and analysis of data. Digital/smart infrastructure will allow infrastructure to be used more efficiently. For example, smart traffic lights would improve traffic flows because cars would spend less time stuck at red lights. Additionally, data generated by digital infrastructure will allow providers to gain more accurate and timely insights about performance. Another benefit of digital infrastructure is that it makes it possible to gain insight into real-time conditions. Civil engineers can monitor structural changes in roads and bridges and perform preventive maintenance before there’s a major issue. How do we go about implementing hybrid digital infrastructure? Robert Atkinson suggests the next administration establishes a council for digital infrastructure made up of key officials from federal agencies involved in infrastructure. He believes they should meet regularly and develop strategies for advancing the transition to digital infrastructure in the areas they influence. To implement these strategic plans, the president should ensure that the first budget sent to Congress includes significant funding for the transition to digital infrastructure. How Trump is going to handle this new idea of infrastructure remains to be seen, but experts agree that it must become increasingly more digital and connected.